Solar winds ejected from a monstrous gash in the surface of the sun are barreling towards Earth and scientists have warned to prepare for a solar storm today. A solar storm alert is in affect for Tuesday April 10 and Wednesday April 11, the US Space Weather Prediction Center (SWPC) warned. Scientists at the SWPC have observed a hole in the surface of the sun, which has opened up this weekend to release a “high speed stream of activity”. The storm’s strongest impacts are expected to be felt across Tuesday and Wednesday “primarily poleward of 60 degrees Geomagnetic Latitude”. People have been warned to expect weak power fluctuations and minor impacts on satellite operations. The gigantic coronal hole in the sun’s surface was captured today by NASA’s Solar Dynamics Observatory (SDO). Coronal holes like this occasionally open up in the burning star’s magnetic field, releasing large amounts of charged particles and solar winds. 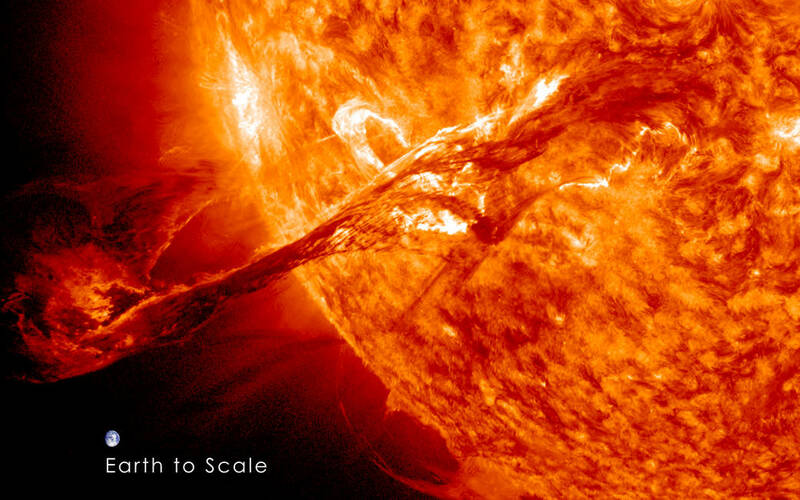 When solar winds slam into Earth, they are known to interfere with electronics and communications. Aeroplanes are also at a particular risk if the onboard apparatus is interfered with but thankfully the predicted storm is too weak to cause any havoc. The SWPC classifies G1 storms as minor ones and are typically associated with the Northern Lights. A geomagnetic storm would have to reach G4 Severe or G5 Extreme on the official SWPC intensity scale. Right now the most prominent effect of the solar storm will be the presence of the Aurora Borealis Northern Lights across parts of the United States. Have you felt any of the above lately? Our lower emotions are low frequency energy stored in our cells from past experiences and traumas that we have encountered and never processed – so they become stored as cellular memories. Photon energy is a much higher frequency energy that pulls up the lower emotional frequency so it can calibrate to the higher frequency… thus we find ourselves releasing these lower emotions of sadness and grief without knowing why. An interesting fact about this energy is that since it is of a higher frequency it creates the power of instant manifestation of our thoughts, which means whatever we think, we create instantly. This has never before happened in our lifetime [previously there was a delay between thought and its manifestation – Messenger Spirit] and that is why many people are writing books on the subject of the Power of Attraction.